The Parish Council is a consulting group within the Parish. This council provides consultation to the Pastor in matters related to maintaining a healthy parish. This can include almost any aspect of parish life – maintenance and use of the physical facility, services and support offering, schedules, parish membership and volunteer activities, religious education, additional parish committees…the list goes on. There are 6 members and are nominated by parish members and serve a 3 year term. The finance council has 4 members who meet with the Trustees and Pastor of the parish and discuss any financial issues affecting the parish. They look over the financial reports. The fall festival committee is based on volunteers who plan and organize the Fall Festival. Members serve on the committee for 2 years. 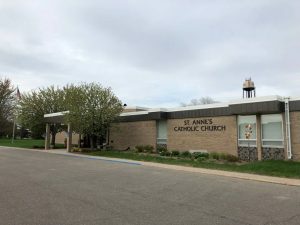 St. Anne’s women’s group meets on the 2nd and 4th Tuesday of each month at 9:00 a.m. Everyone is welcome to attend any or all meetings. This group provides a chance for women to get out, meet new friends, share a craft or project or just share a laugh. The meeting starts with prayer and then work begins on a project. In the past, members have worked on making greeting cards, rosaries for missions, baby bibs and burp cloths. Coffee is served. This program is sponsored by Catholic United Financial which provides volunteer opportunities and then rewards St. Anne’s for each task completed. In the back of church is a MinisTREE that has cards on it naming different tasks or needs that can be completed. Anyone can take a card, complete the task, fill out the card and turn the card into the parish office or drop it in the collection box. These cards are then sent to Catholic United Financial who pays St. Anne’s $5.00 for each task completed up to $500 per calendar year. Check the tree often to see if there is some way you can help out. The Religious Education is headed by Betty Nystrom who overlooks the Religious education program. Grades in the Religious Education program are K-11. Classes meet September – April, on an every other Sunday rotation for 1 ½ hours. Teachers are on a volunteer basis, if interested call Betty at 398-2211 ext. 12. Group of Lay ministers who are part of our liturgical celebration. Liturgical Ministries consists of Lectors, Eucharistic Ministers, Ushers, Alter Servers, Sacristans and Music Ministries. If interested in participating in any of these ministries please call the parish office.